It’s so overwhelming, isn’t it? Just taking a quick inventory of all the marketing strategies, tactics, tips, and tricks can make your mind swim in confusion. There’s Facebook, Pinterest, Twitter, blogging, email, advertising, Tumblr, and the list goes on and on and on. And everywhere you look, there’s some guru out there telling you how you can make a million dollars overnight with some “secret” or silver bullet. If you’re looking for an over-hyped magic formula, then close this post because the rest of it is going to be a complete waste of your time. But if you’re looking for a strategy that will grow your business over time, then stick around because I’m going to share my marketing plan with you. I’m going to show you in full detail exactly what I did to generate leads and sales. After marketing the products and services of other companies as a consultant, I finally set out to build a start-up of my own, including creating a marketing plan. 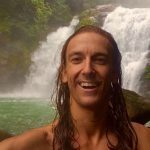 I never set out to publish it, but after showing some friends how I was able to get my first few online sales, I thought it might be useful to share to everyone. Over time, I’ve come to learn that there are three key ingredients to every successful online marketing plan. Get Traffic: The first ingredient to a successful online marketing plan is to get people to your blog or website or online store or Facebook page, or wherever. If you can’t get people to come to the location where you plan on making sales, your online marketing plan is cooked. Get People to Know You: Some people call this ingredient engaging, others call this ingredient building authority. Personally, I just want to get as many people as I possibly can to know me and like me. It’s much easier to make sales to people who know and like me than it is to strangers. Make the Sale: The third key ingredient to a successful marketing plan is to make the sale. If you’re able to get traffic and you’re able to get people to know you and like you, then making the sale becomes much easier. Now I’m going to take you through all six steps of the marketing plan. Step 1: Who are you selling to? It sounds obvious, but before you can begin marketing, you first need to identify who you’re selling to. I find this to be the biggest mistake business owners and marketers make. The temptation is to sell to “everyone”, but the more specific you get, the easier it is to market your business. To identify my ideal customer, I created marketing personas that were as specific as possible. A business owner with a traditional sales team and relationship based sales process who wants to alert his customers of other products and service offerings. A busy marketing director who doesn’t have the time to create content, optimize a newsletter for various devices, or track conversions. She just wants to get her emails out and be able to show her boss results. These are businesses with at least $500,000 and no more than $10MM. This means they have between 5 and 50 employees. These are also “B2B” companies that could benefit from a consistent outreach program to their prospects and customers. Making one on one sales will accomplish two things. First, it’ll help you find your first few customers. But more importantly, it’ll allow you to hone your messaging. I’m looking to start a service that helps small and mid-sized businesses like yours generate leads without breaking the proverbial bank. If you’re interested in learning more, let’s set something up for Friday at 2. Because I had a relationship and direct access with each person, my response rate was 100%. Once I set up the meeting, I wanted to do two things. First, I wanted to make the sale. Second, I wanted to listen to the objections they had. If I can’t identify and overcome the objections of people who I have a relationship with, then it’ll be impossible for me to do this online. Also, I had a predetermined set of questions that literally took 7 minutes to answer. So the only time restraint on them was 7 minutes. And to overcome the “will it work” objection, I offered a free trial to a friend of mine who so I would have a case study and testimonial to show off to my prospects. Once I was able to show off a case study and demonstrate the quality of writing, it became a much easier sale. Referrals are the quickest and easiest way to generate new leads, yet so few businesses ask for them. After I had finished my work with these original customers, I had three questions to ask them. Now it’s time to take what I learned from my face-to-face sales and build out your online marketing funnel. Case studies. People need to see the quality of newsletter they can expect. They also need to see why and how they’re going to generate leads. A lot of my customers have been burned in the past and are skeptical of “marketing” services. A Guarantee. I’m going to keep the quality guarantee. This will help make it a no-brainer. Emphasize Leads. The primary reason these initial companies were excited about my service was the promise of new leads. My absolute favorite way to get traffic is by writing guest posts. First of all, they’re free. For entrepreneurs on a tight budget, you can’t beat this. And second, the traffic that comes from a guest post is usually warmer than traffic that comes from an ad. In the past I’ve found that a person coming from a guest post is 50% more likely to convert into a customer than a Facebook ad. I don’t know if that will be the case here, but it’s a start. These are assumptions based on past experiences with other products and services that I’ve marketed in this price range and to this group of people. 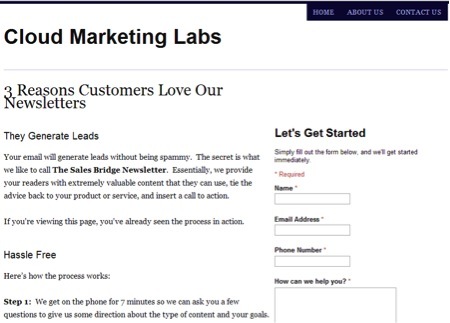 On average, each guest post will generate 80 emails and 10 new leads. I believe I’ll be able to close 3 deals out of those 10 leads. One guest post = 3 customers. My goal is to get 50 more customers, so that means I’ll have to write about 17 articles just like this one. In my experience, when you produce a large quantity of guest posts in a short amount of time, their effectiveness rises exponentially. Unfortunately, that is impossible to predict, so we’ll keep these numbers conservative for now. The first step to guest posting is finding blogs where your personas reside. The easiest way to do this is through a site called alltop.com. Since one of my personas is marketing directors, I would guess they read a fair amount of marketing blogs. 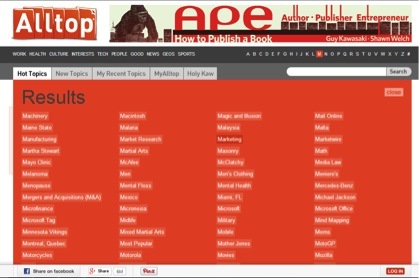 I’d go to alltop.com to find the extensive list of marketing blogs to see which of them accepts guest posts. Another option to find guest post opportunities is to use Google. 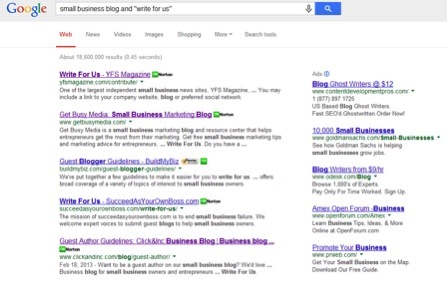 And what appears is a list of small business blogs who are looking for guest posts. After I used both methods to find a list of places to guest post, I created a simple spreadsheet to keep track of which blogs accept guest posts, which blogs I’ve submitted posts to, and the status of each post. Then I’d do the same for marketing blogs. At the moment, I have a list of approximately 20 or so blogs to write for. Reaching out isn’t nearly as hard as some people want to make it out to be. I noticed that several of your posts regarding lead generation get a lot of traffic. For instance, the post “(insert title of post here)” got 300 tweets and about 200 other social media shares. Would it be cool if I created a post called “(insert post title here)”? I can get it to you by the end of the week. By using this exact script, I’ve been able to write for popular blogs like this one, this one, and this one. The hard part isn’t reaching out to bloggers, it’s creating great posts. In fact, this post, from beginning to end took nearly 9 hours to write. Once I get traffic back to my site, I’m going to need to convert it into sales. I’m making two assumptions here. Assumption 1: I’m going to need to collect email addresses first. Assumption 2: I’m not yet ready to make this an automated web based sale. I think I’m going to need to get the person on the phone first. Eventually, I’ll move forward and test out an automated sale. Based off of my face to face sales, I decided the best way for me to collect email addresses is with case studies. This will show prospective buyers the quality of emails they’ll receive and explain why they work. The home page of the website is designed to collect email addresses. It’s essentially a landing page, and that’s not an accident. My prospects are not going to buy my email marketing service on a whim. My face-to-face sales told me they’ll need to be educated. 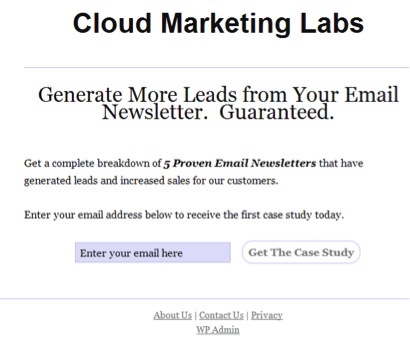 After a person confirms their email address, they’ll receive the first of five case studies. Also, they’re taken to my “About” page. This is the page where I tell the story of the company and who I am. As I stated before, it’s easier to get people to buy from you once they know who you are. On the bottom of each case study, there is a link to my services page. The goal of the services page is to get prospects to sign up for a consultation. This is where they could see if the service is right for them. On the services page, I again try to overcome the objections a person might have based on my face to face sales. Are you ready to implement a proven marketing plan? If you stuck with me throughout this entire post, then you have the tools you need to sign up more clients, get more customers, and grow your business. The only question is, are you willing to use these tools? Like I said in the beginning of this post, this wasn’t going to be some magic pill or silver bullet. This is a marketing plan that you can implement over time and see results. So here’s how you can get started. First, I want you to take a deep breath. You just consumed a lot of information and I’m sure your head is swimming with ideas. Second, print out this post, or bookmark it, or whatever you need to do and start at step #1 and create your buyer personas. Finally, move through this plan at your own pace. There’s no rush and no need to feel like you have to do all of this in one night. Just promise me one thing. When you become rich and famous, all I ask is that you remember me. 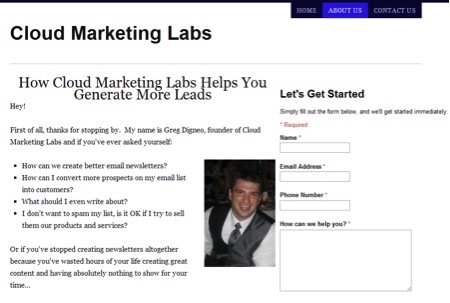 Greg Digneo is on a mission to help B2B companies create email newsletters that generate revenue without being spammy. If this is you then check out a case study where he shows you 5 profitable email newsletters and why they work.